A Republican women's group is pushing back against Democrats after three of the GOP's 13 women in the House of Representatives were listed as top targets for the 2020 elections. A memo containing the Democratic Congressional Campaign Committee's (DCCC) top target list was released on Monday that shows the committee will focus on 33 congressional districts controlled by Republicans, three of which are the districts of Reps. Jaime Herrera Beutler (R., Wash.), Susan Brooks (R., Ind. ), and Ann Wagner (R., Mo.). "2018 was just the tip of the iceberg for Democrats," Rep. Cheri Bustos (D., Ill.), chair of the DCCC, said on Monday. "Today we are announcing our plan to go on offense and grow our New Democratic Majority. We have a clear path to expanding our Democratic Majority, and by putting our plans in motion earlier in the cycle than ever before, we are demonstrating to Democrats across the country that the political arm of House Democrats is operating in high gear from the start." Now, Winning for Women, a Washington, D.C.-based right-of-center group that is dedicated to electing Republican women to Congress, is sounding the alarm against the Democrats' efforts in the districts represented by the three Republican women targeted for the 2020 elections. "After the last election, there are only 13 conservative women in the House," the group said in a Monday email blast to supporters. "And the Left just announced they're coming after 3 of them." 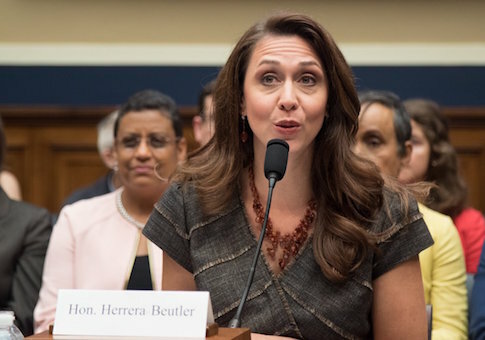 "The DCCC released their 2020 target list this morning, naming Reps. Jaime Herrera Beutler, Susan Brooks, and Ann Wagner as three of their top targets. Liberals claim to want more women in office, but they're already coming after women on the Right." Winning for Women, which was founded in 2017 as a counter to the liberal EMILY's List, has since recruited more than 300,000 members, endorsed nine candidates who won their elections, spent $1.4 million on digital, television, and mail outreach, and will now turn their sights to the 2020 primaries "so that women candidates have resources from start to finish," said Olivia Perez-Cubas, spokeswoman for the Winning for Women PAC. "The number of Republican women in office is at a crisis level, and Democrats have already targeted three of them," said Perez-Cubas. "We need to fight to make sure women on the right don't just keep their seats, but that they win more seats. There's no better time to start doing that than now." This entry was posted in Politics and tagged 2020 Election, Republicans. Bookmark the permalink.